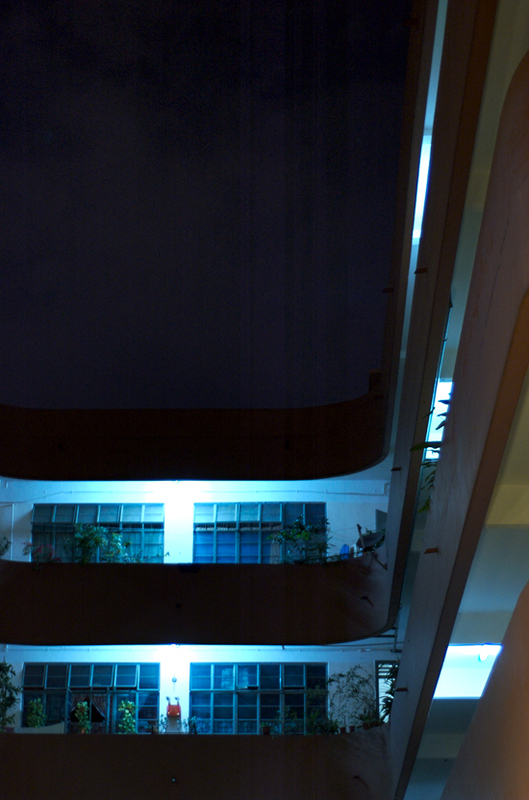 The other night when Myra and me went on a night-time walkabout, she showed me this flat. 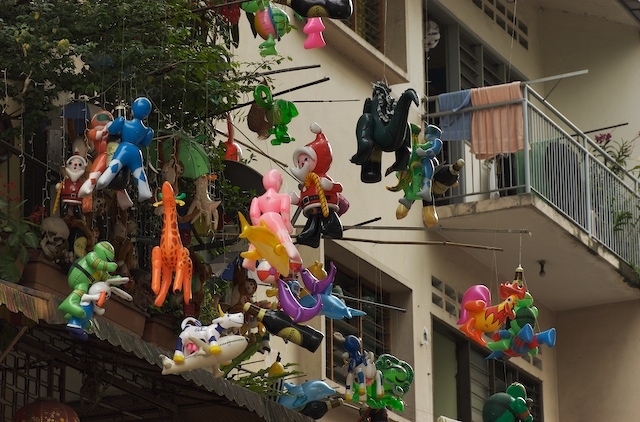 We both wondered who lived up there and was so creative in decorating the balcony with these blow-up toys. However, the shots we took at night didn't turn out so well. I went back a couple of days later to get a shot in daylight. Hey Karen, can you see the chicken? It's New Year's Eve! What are you doing tonight? I'll be at a BBQ at a friend's house and we may walk down the street with all the revellers. Who knows? When tomorrow comes, it'll be fantastic. Fruits anyone? I fancy a banana just about now. 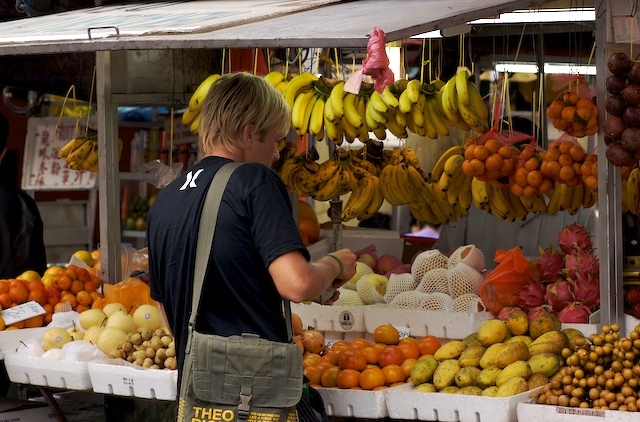 Here's a tourist at one of our many fruit stalls. I stood watching him for a couple of minutes as he chose his fruits and haggled the price. A tourist well versed in the art of local street ethics. One more day to enjoy 2006 and all the fruits of your labour. Come Monday, another year begins with it's own set of dreams and aspirations. Do you have any? I do and I'm ready to take it on. This weekend I'm staying home to clean and fix broken things like wind-chimes and chairs. Hope you have a great final weekend of '06. Noodles anyone? This is a noodles franchise that is fast popping up around the city. I've not tried it myself so I have no comment about quality or taste. When it comes to noodles, I'm still an old-school-by-the-roadside-is-best kinda noodles guy. As far as I'm concerned, no one does it better than the men and women from the older generation. But they are getting old and have nobody to continue in the line. I guess that's why these 'new' noodle shops open. Mass produced for the new mass generation. Well, one day I'll walk into a shop like this. Till then. What's in a footstep? A whole lot if you know about foot reflexology. Every nerve in your foot corresponds to a part of your body. Take a look at this picture. 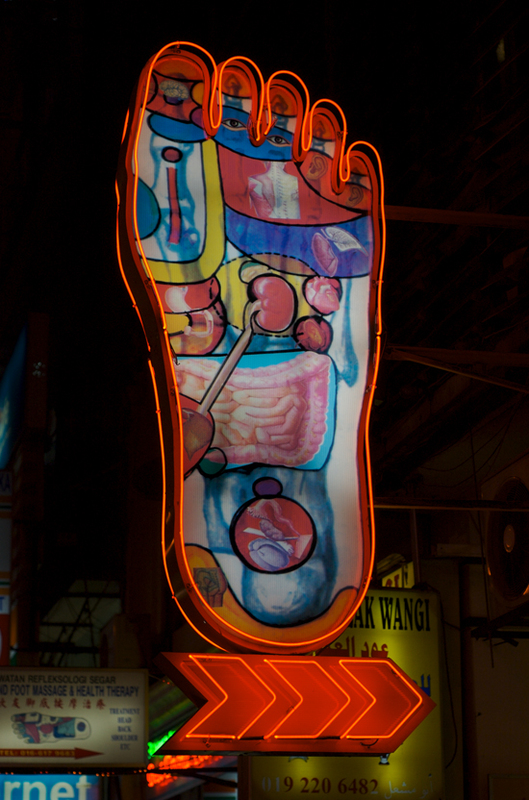 It's a shop sign and you can see how cleverly they painted the 'foot' to show what goes where. Looking at this reminds me that I have to make a long-overdue appointment with my acupuncturist. The days have been hot, very hot. You can see here how people have found an escape from it. 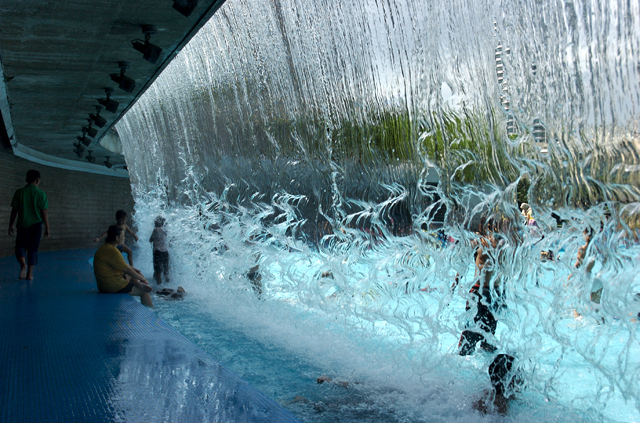 The wading pool at KLCC park.As I type this I'm sweating. I've asked the heavens for rain but then again, the storms that have flooded the southern part of Peninsular Malaysia are travelling northward. The floods have caused many people to be evacuated. It'll be a couple of weeks before anything gets back to normal. Then, the earthquake off the coast of Taiwan, causing a disruption in communications throughout the region. Authorities sent out an alarm for fear of another tsunami incident. Complete insanity. Water can be such a solace but in a split second, a force of nature so strong, nothing can stand in it's way. Nothing. What does this picture bring to your mind? For me, it's the image of St.Christopher carrying baby Jesus across the river. Funny that a Muslim boy like me can have this image in my head. Must be the festive season and being brought up with Roman Catholics for relatives. It's the day after Christmas. Most of us call it Boxing Day. In England, it was the day when lords used to give their servants gifts and also the day when these rich lords go hunting. In Europe, it's St.Stephen's Day. Here in my house in Kuala Lumpur, it's St.Lose De Phatt day. So much eaten these past 2 days. I've had enough turkey to start a farm. And I'm constantly craving Fruit Cake! 5 days more to 2007. Can you believe this year is over? It's gone by so much faster than last year. I've also noticed how much faster the years pass when you're older. Or is this just me? Well, whatever it is, it's time to make the move and cross over to more new experiences. ps. James Brown, the Godfather of Soul, passed away early Christmas morning. Rest in peace. You are a true legend. This is little Liam, my friend Lissa's beautiful son. I took this picture when his aunt Way Cheng and me took him out for an evening stroll. I'll be seeing him soon when we get together for Christmas lunch with all my dearest friends and their children, Marcus, Zhiwei and Janya (Liam's cousin). The morning has been wonderful. I've unwrapped 2 presents so far. One the gift of passion (a funky die-shaped lighter) and a gift of memories (a photo book from China). While I was Singapore, Karen gave me the gift of protection (a red Speck hard shell snap-on for my laptop). So, like little Liam's beautiful smile, I hope your Christmas day is beaming with joy! 'Twas the night before Christmas, a boy looks outside his window and wishes upon the brightest star. He wishes for mummy and daddy to live forever, so that they'll always be there to take care of him. He wishes for presents, he prays for his family. Most of all, he hopes Santa rides safely and comes soon. The boy is now a man. A man who wishes for love and happiness. Of peace ever after. He prays for a better tomorrow and kisses his mother goodnight. He also wishes for presents but doesn't mind if he doesn't get any. As long as he's happy. Tonight, all of us will be somewhere making wishes and prayers. It doesn't matter what religious faith we follow. 'Tis the season of giving, sharing and caring. My wish is for all of us is to love in a world proud of the celebration of life. Tomorrow is Christmas Day. Tonight we live. Tomorrow we unwrap our wishes. Last night, Myra called to say that she was bored at home. I was restless so I suggested with roam the streets and do some night photography. Here's one I took of KLCC. I tell you this new lens of mine is spectacular! The details it captures and I didn't even need to lock down my monopod. Steady and stunning. 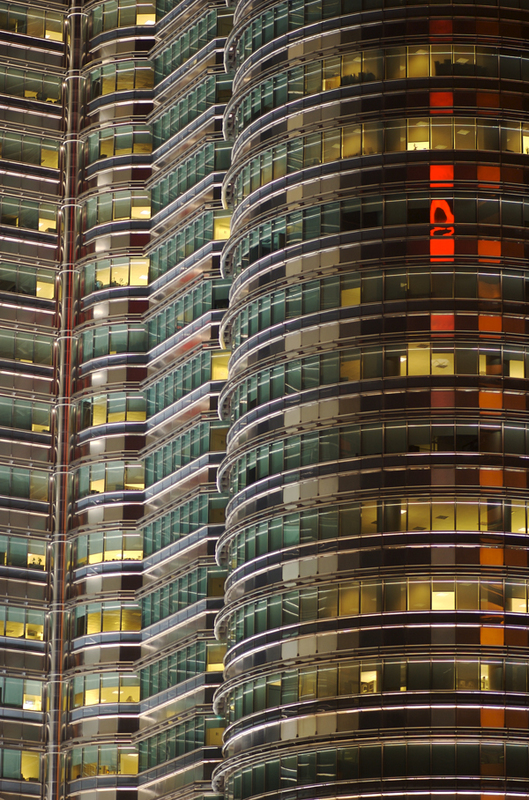 One side is lit by it's own spotlights while on the right, the red lights of the opposite building are reflected. 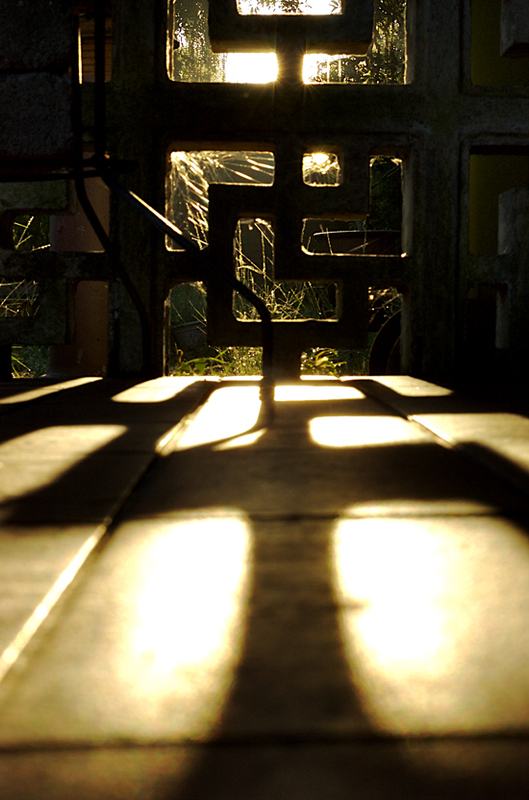 Again, this images lends itself to my shadow and light collection. Thanks for a great night Myra and have a great time in Thailand! Yesterday, I went to visit a friend and together we took her little nephew and niece, Liam and Janya, out for an evening stroll. We walked up Ceylon Hill, a lovely cul-de-sac. Of course I had my camera. Bought a new lens and was playing with it. This was what I discovered. Another old colonial house hidden from the traffic and noise of the city. Some of you may remember an older KLDP picture of an old house. This house stands behind it. I didn't see it then and was only fortunate this time cos I was on a hill looking down on the green. The last 2 posts I played with night shadow and light. Now we wake up for the morning. Again, taken on my front porch and being as light-headed as I was, I think it came out well. We're getting closer to ushering in a brand new year. I'm not sure if I want to make any resolutions this time. I sat back last night and realised I've had such an amazing 2006. New friends, new perspective of things and was part of some great projects. Then Daily Photo comes and opened my eyes to another new and exciting passion. Next year looks swell and I don't want to jinx it by putting down on a piece of paper what I must and must not do. Just clear those cobwebs. And my friends have already opened the Chrissy presents I gave them. I thank the lovelies in Singapore for my presents, Karen, Rachel, Daniel and Chris. Myra and Fahmi in KL, what is in that little bag? Can't wait for Chrissy Day! Here's another one from my wanton noodle walkabouts. It's a 60/70s apartment block that's recently been repainted (not that you can see it in this light) and I've always wanted to take a picture of it. I went out one night for supper with a friend who was craving Wanton Noodles. I parked where I could and we walked to the noodle cart. Yes, cart by the side of the road. I took a couple of night shots as we walked. 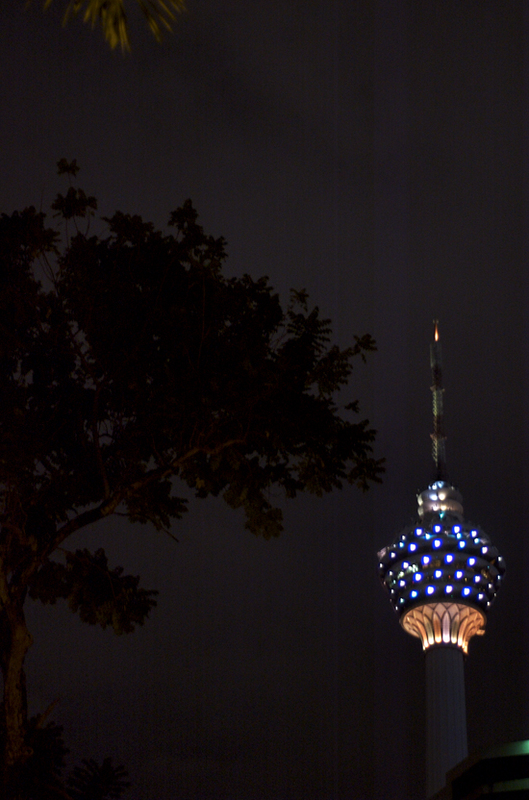 This one is of KL Tower. No tripod though. I did the best I could to avoid any camera shake. If you look, you'll notice the silhouette of a tree. I like this shot because it plays on a shadow and light phase I'm going through at the moment. Here's a basket of rambutan for you! 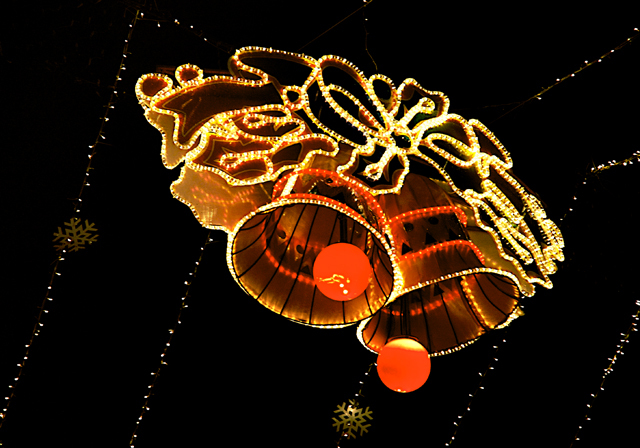 It's Monday, the start of a new week and we're getting closer to Christmas and 2007. The least I could do is virtually share my harvest with you. This week is looking to be quite fun. Lunches with friends and meetings with potential corporate clients for the coming year. All's well that ends well they say. I think they said right. Take this time to enjoy the fruits of our labour. Reflect on both the good and bad. Take the best and make it better. And when night comes, put your feet up and smile. Have a great week! I hope I do. No photos from last night's party but fortunately I took pictures before I left for it. 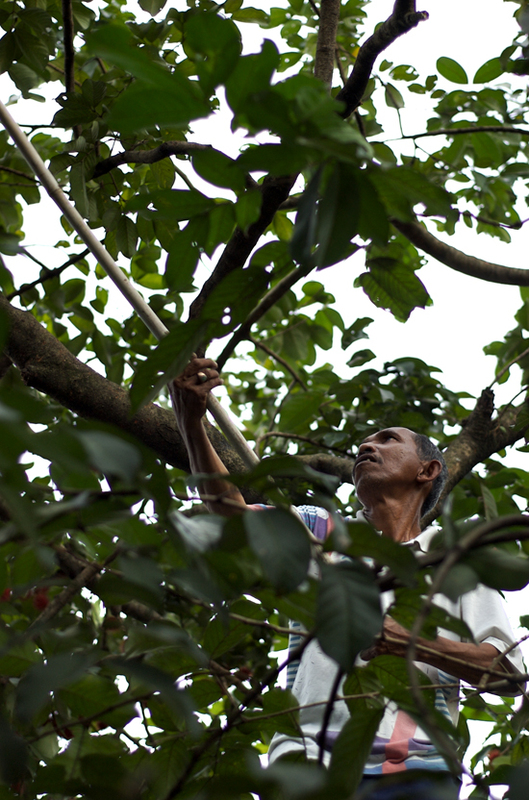 This is Rashid, my sometime gardener, climbing the Rambutan tree to pluck the fruit. Rashid actually works for City Hall but he sometimes comes over to help my mother with the garden. 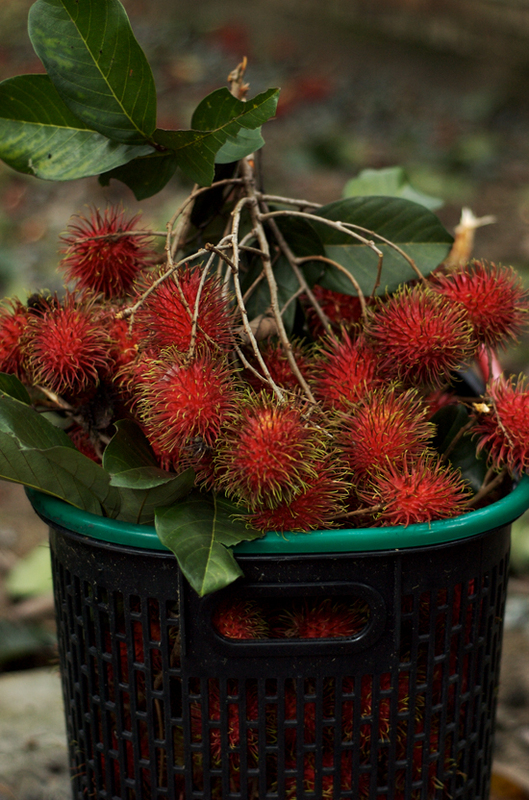 We now have baskets of rambutan fruit. Anyone want some? This time they're very sweet and juicy. 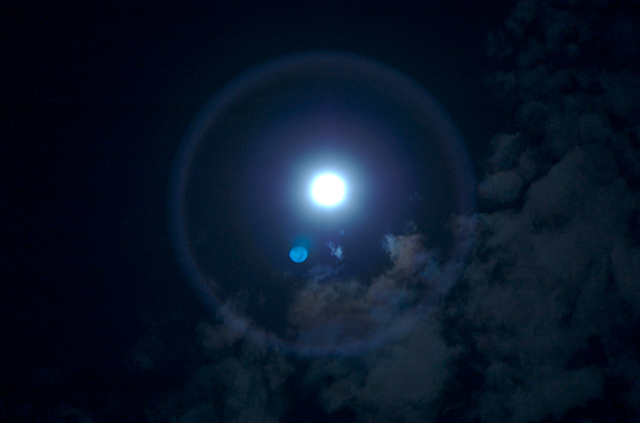 Now I know why the moon's colour is often described as blue. And made of cheese. Stinky Danish Blue perhaps? Yummy! My favourite kind of cheese. I took this shot the night before I left for Singapore last week. I know a moon shot is kinda generic to every city in the world. I like it because it's my moon. The one I look at when I need to focus and calm down. Tonight I'm going to a friend's house for a cosy Christmas get-together. Hopefully I'm not too plastered to take a couple of shots for tomorrow's KLDP post. Remember the porcelain tile roof from a couple of days ago? 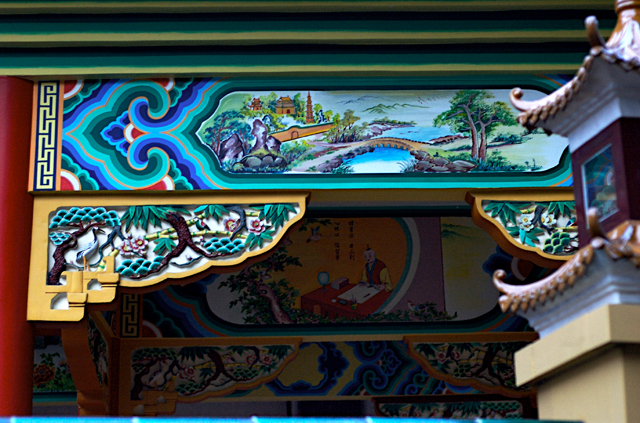 Here's another shot from the same temple. For the gastronomist, this temple is right next to Chef Choy's, one of the best Chinese restaurants in town. I've been experiencing problems with commenting on Blogger blogs. Only managed to make one comment since I've been back. So please excuse me while I go scream at a wall. I'll keep trying until the wall comes down. How are you today? After last night's automobile fiasco, I'm now waiting at home for my car to finish it's 'botox' treatment. The sky has decided to pour and the cool breeze is such a welcome from the heat and humidity of the afternoon. Doing some work while I wait, with a coffee by my side and listening to Bobby McFerrin. So, here's a cuppa I ordered for you. Hope it's just the way you like it. I'm home! Had a wonderful time in Singapore just chilling and swaying. Came home and the crap began the moment I drove into the city. It ended with having to change my car battery. What happened? I think someone tried to break into my car and it set off the alarm and drained the battery. Long story short, it took 2 hours to sort it out. 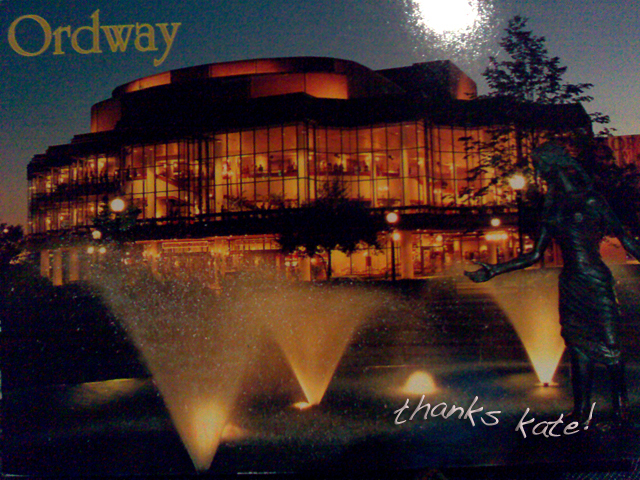 BUT despite a lousy welcome home, an old friend called and I found this postcard from Visual St.Paul on the table. Thanks for making me smile really wide girls. 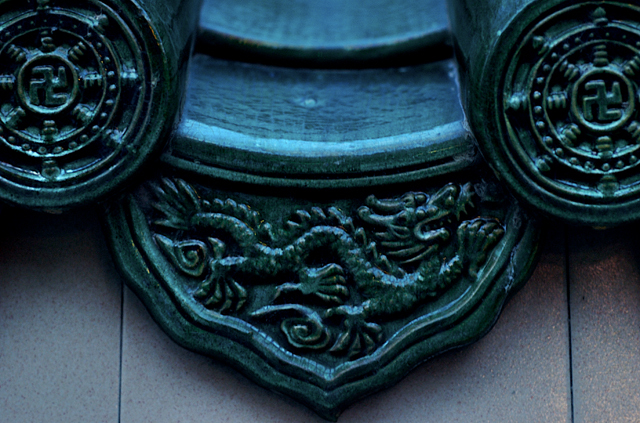 Porcelain tile roof of a Chinese temple on Jalan Ampang. It's great that this temple stands smack center of the business district. Nothing much to say today. Spending my last night in Singapore before I drive in the morning. I'm ready for home. Thanks to Karen, Sweech, Rachel, Marlyn and little baby Livi for making me smile everyday and putting a roof over my head. Can you hear the Merlion roar? Today's it's all grey. Concrete grey. Another project to rival all the others. This one is called Pavilion, a business/residential/shopping combo that is set to give KLCC a run for it's money. 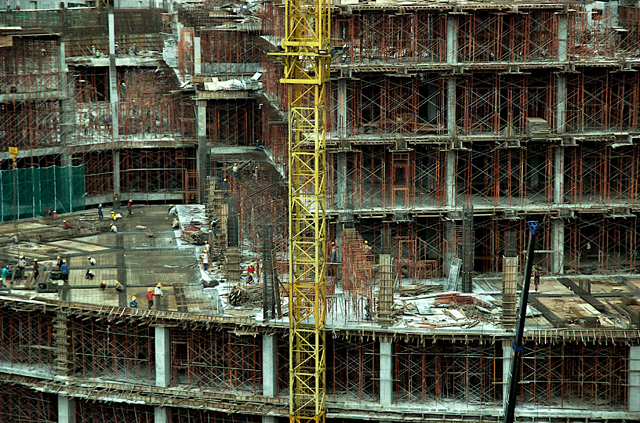 The apartments are 80% sold (RM1.6million onwards), the shopping mall entrance opens to Bintang Walk (the shopping district) and it won't be ready until 2008. On the shopping topic, I finally decided what to get my friends for Christmas! Singapore has been good to me. Can you believe this is in the heart of the city? 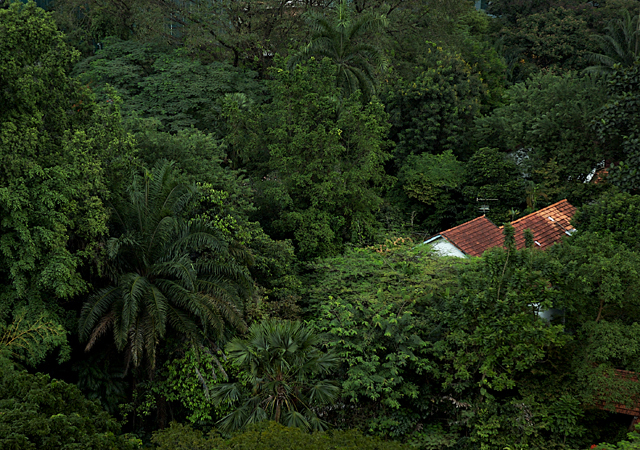 Yes, with all the high-rise apartments and office blocks, some houses are still surrounded by lush greens. 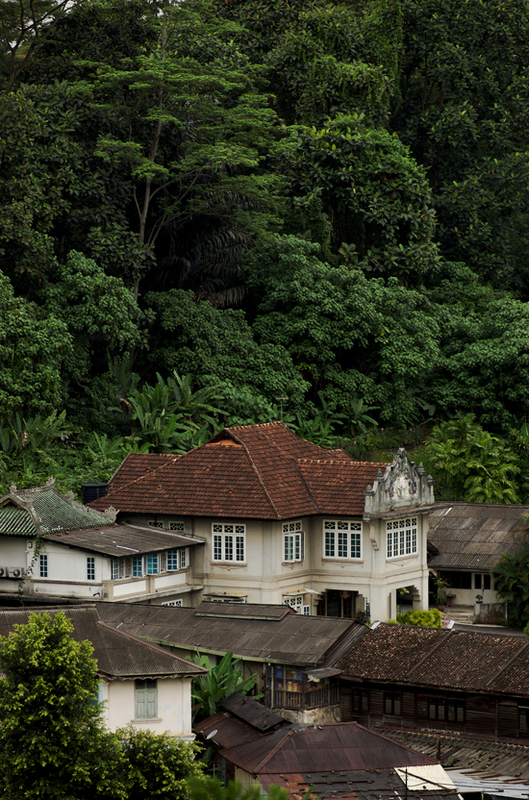 This house is part of Yap Kwan Seng Road, which is only a 2 minute drive to KLCC Twin Towers. I hope the owner of this piece of land doesn't succumb to commercial demands. Singapore is doing me well. Spent 3 hours in the Botanical Gardens and another 3 hours with Keropokman of S'pore DP. Raymond had to work at the last minute. Pity. Thanks K'pok for being such a gracious host! I'm having a great time in S'pore! Yes, taken a couple of pictures which you'll see when I get home. My body may be here but KLDP's picture of the day is KL. 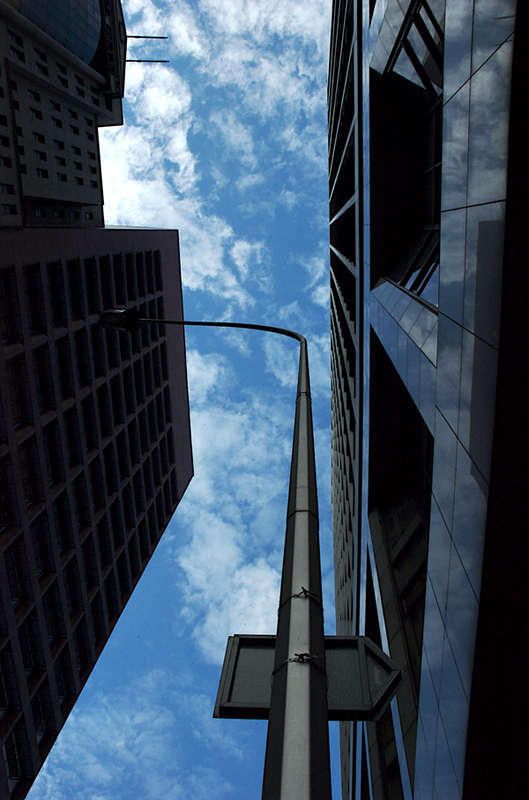 The buildings sandwiching the sky are banks. It was about 10am when I took this shot. I had a meeting in one of them but stopped because the sky looked really beautiful and I knew I was going to be stuck inside for a couple of hours. Took in the view for a couple of minutes and strolled in. I'll be meeting 2 S'pore members tomorrow. We're going to the Copenhagen Tea House. There will be pictures! After what felt like the most tiring week I've had this year, I'm about to pack my bags and drive down to Singapore in a couple of hours. Going to see friends and make new ones. Perhaps take pictures of things. Have a latté every now and then. 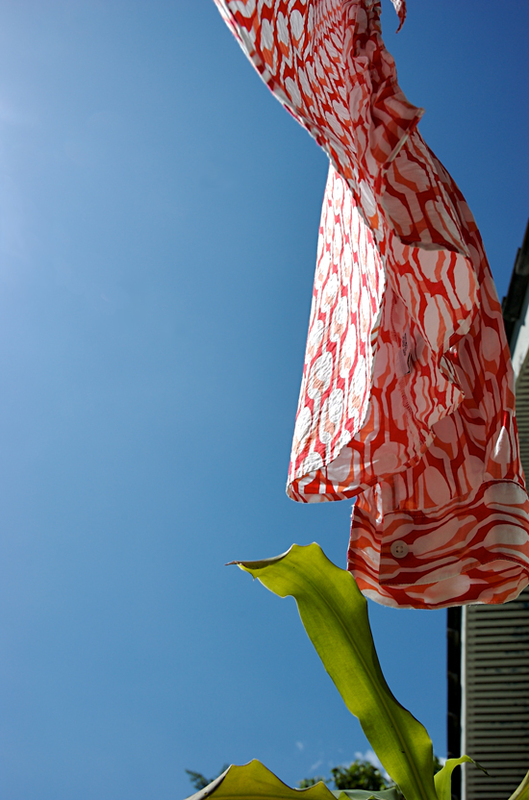 Like the shirt drying in this shot, a breath of fresh air will dry my damp head and body. On Sunday, KLDP and 2 Singapore DPs will be meeting at the Copenhagen Tea House in Takashimaya Mall. I'm looking forward to the unexpected. Okay, packing my bags now. When was the last time you went to the cinema and what did you watch? I don't go as much as I'd like to and thanks to certain 'entrepreneurs' I get to watch the latest movies in the comfort of my own home. However, a couple of days ago I did and watched Casino Royale. We queued for an half hour, got our tickets, popcorn and a large soda pop, and got into the hall early. 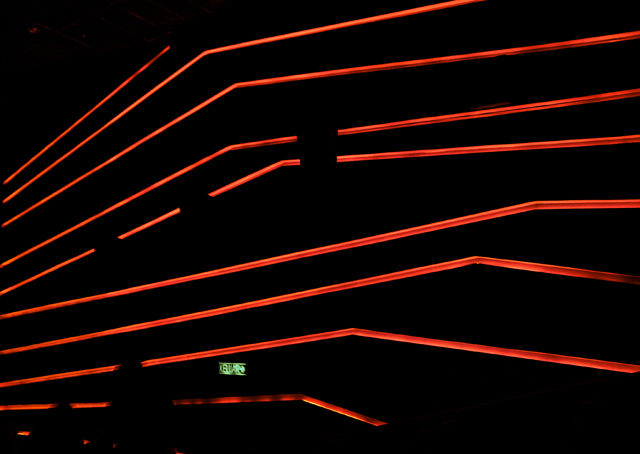 This cinema was recently ungraded with plush red seats and trippy lights lined the walls. Who could resist taking a shot? 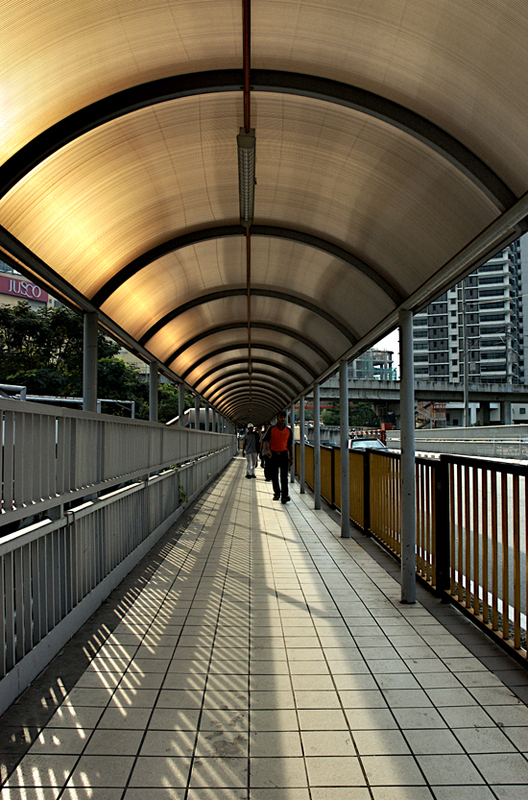 This isn't a shot of what is in KL but it's a shot of what came to KL. As I walked in my house and checked the mail that came, I saw a postcard from HKDP, a gift from my Leosista Lisi. I immediately took a picture of it. It was only after I took the shot did I notice the entire composition. 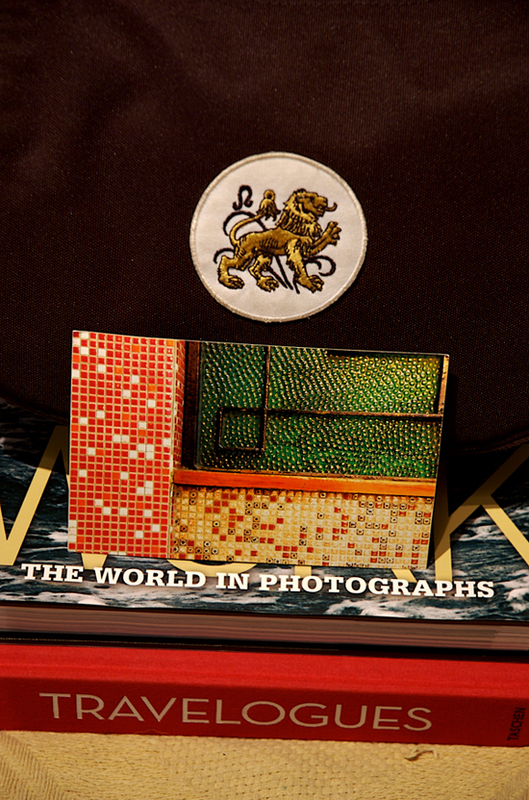 The postcard is propped up against my camera bag, which has a Leo patch on it (Lisi and me are both Leos) and these were on top of 2 books I had bought earlier in the day. Look at what the books are. This shot, I feel describes our DP experiences perfectly. Our community exists oh-so-well. Thanks Lisi (I get along with all the Leos I know). Thanks to everyone too, for the amazing daily travels. These next few days is gonna be mad for me. I've been paid lots to host an event for a very big corporation, the world's local bank actually. Today is the prep meeting and camera setup/rehearsal. Tomorrow the 2-day event begins. Starts at 8 a.m. and ends at 6 p.m. Will have a microphone in one hand and a bag of wit in the other while a roving camera follows my every move as I get 300 managers to tell me the most intimate banking stories. I think it'll be fun but having to wake up and not be grumpy will be the ultimate challenge. Must be chirpy. This pays for my Sydney trip next month. Once the event ends on Thursday, I'm driving down to Singapore for a couple of days. See, there's always something good at the end of a long walkway. Phew! It's a beautiful day. Bright, clear and so hot. Finally, my laundry gets to dry properly. So, why am I posting an indoor shot? Well, to tell you the truth, I haven't shot anything interesting these past few days and going through my archive, I found this one which I kinda like. It looks like a futuristic spiderweb, doesn't it? 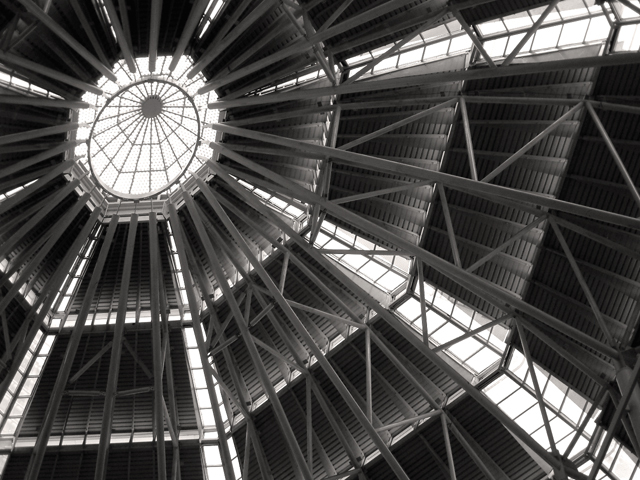 It's the roof over Suria KLCC's concourse. 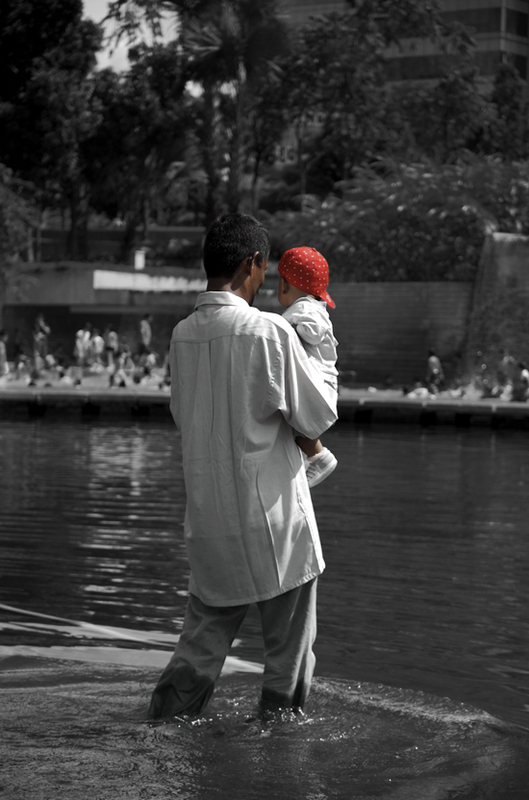 This was something I took before the days of my super DSLR. Completely forgot about it. People always tell you to learn from the past and move on. Well, I'm glad I went back in time. Some things are worth the memories, no matter how painful they may have been. Here's to a great week! Don't ask me what I was doing here. I was quite close to the flame. All I know is that was my order of Fried Rice and yes, it was delicious. 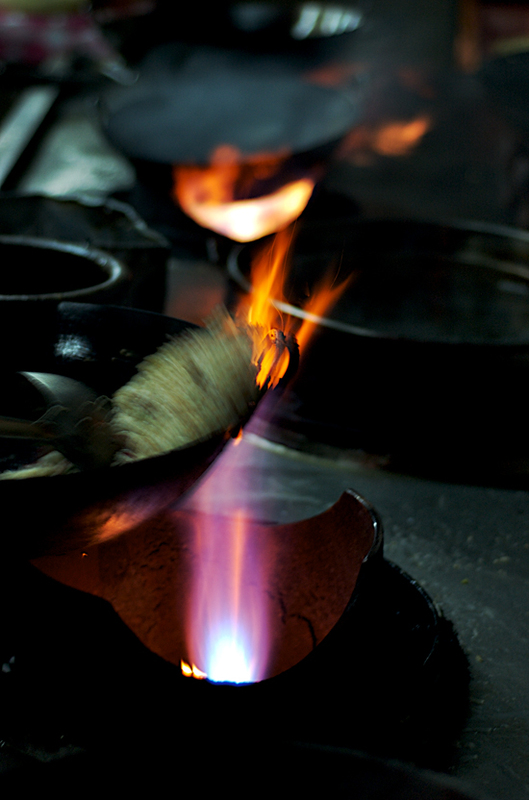 In and around KL, there are stall/restaurants, mainly Chinese owned, that we call 'Tai Chao' (loosely means big fry). Probably the best 'homecooked' meals you can get. The one I frequent is in Jalan Ampang next to the Ampang Mini-Market and the wedding photography studio. 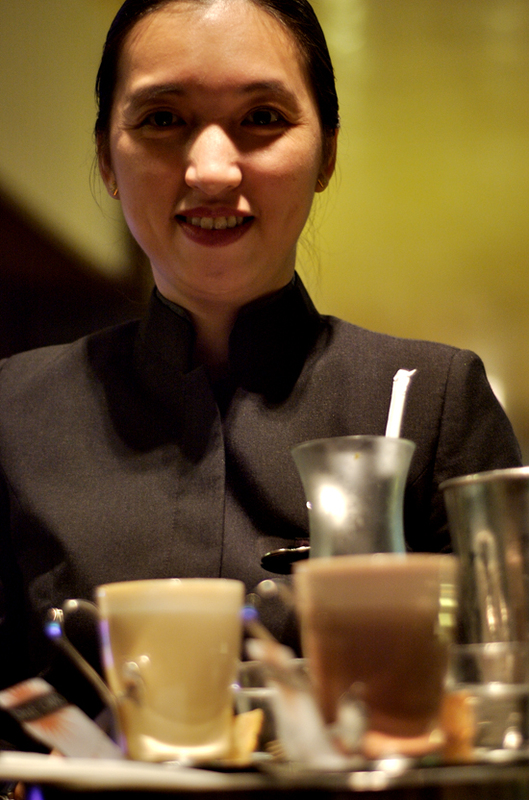 Finding this Tai Chao isn't difficult, getting there is. Jalan Ampang is known for its awful traffic. So, it's good you're ready for dinner no earlier than 9pm on weeknights. I saw this on a friend's bedside table. The combination of words struck a chord with me. TWAANG! 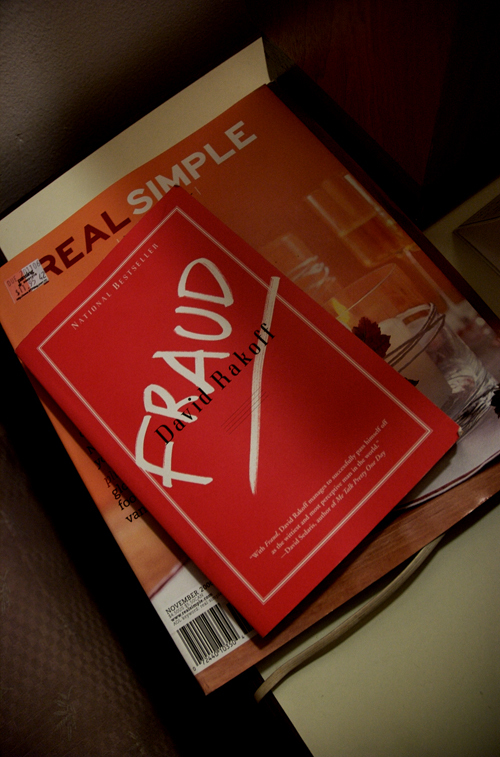 Real Simple Fraud. As an actor/director, I wonder sometimes if I really do have it in me. Lately, I've been thinking of setting up a small studio to do professional portrait photography. Again, I wonder if I can or just pretending that I can. I love all aspects of my work. And as confident as I am, there are days I feel I'm in a darkroom. We all have questions that need answers. I usually get them, answers that is. This is one of those other days. I'm restless and thinking too much. You know, that kind of day. Enjoy the weekend my dears. It's DP theme day again! A monthly thing and I usually get cramps from wondering whether I got it right and how people like my contribution to the theme. I have 2 final shots and the cramps came from choosing between them. And people look at me as if I'm deranged when I show the half shot. The questions, 'Where's my face? What's the attraction down there?' keep popping up. Dear, if you don't know, then I can't answer. Today is World AIDS Day. You know what to do. Anyway, click on any one of these numbers to see how derangedly talented the other DP members are.